This is a public service announcement from someone who has years of experience with this vine…namely me!! In short, stay away. Don’t touch. Don’t eat the berries. And in my case, don’t even look at it. The penalty is an insanely itchy rash that will last for weeks and drive you crazy. I took these photos on our property this afternoon, so this noxious weed is growing now….and lurking….and waiting for the unsuspecting. Poison Ivy is easily recognizable once you know what to look for. Nothing else looks like it. It can grow in clusters on the ground, or it can climb a tree. We have seen years old vines that have a trunk about 4-5 inches in diameter and have reached the top branches of a 50 foot tree. All parts and phases of the plant are poisonous: the leaves, the stem, and even dead and brittle pieces that you may inadvertently pick up years later can harbor the poison which is an oil called urushiol. The plant produces black berries in the summer which are very nutritious and harmless to birds, (but highly irritating to humans). The plant is propagated when the birds eat the berries and deposit the seeds in their droppings. Don’t be lulled into thinking that if you stay out of the woods, you will never come into contact with poison ivy. My first run in with the itchy weed was in my backyard in a suburban golf course community. I contracted it while sitting in my flower bed in shorts, pulling weeds. I’ll let your imagination run wild here. It was not a pretty sight. So what do you need to look for??? Leaves of 3. Not everything with 3 leaves is poison ivy, though. Look at the shape of the leaves. They are irregularly lobed. Some leaves have lobes on both edges, and some leaves will have a smooth edge on one side and have lobes on the other side. When the vines get mature, they will have a characteristic hairiness. “Danger, Danger, Will Robinson”. Whoops, I just gave away my age. Now on the other hand, this is Virginia Creeper. Many people mistakenly think this is poison ivy because it is a vine that grows high in trees. This is a harmless plant, and should be admired. In the fall, the leaves turn a brilliant red, and virtually light up their host tree. Note the obvious difference here. How many leaves? FIVE. Now here is a photo of a Virginia creeper growing side by side with a poison ivy vine. 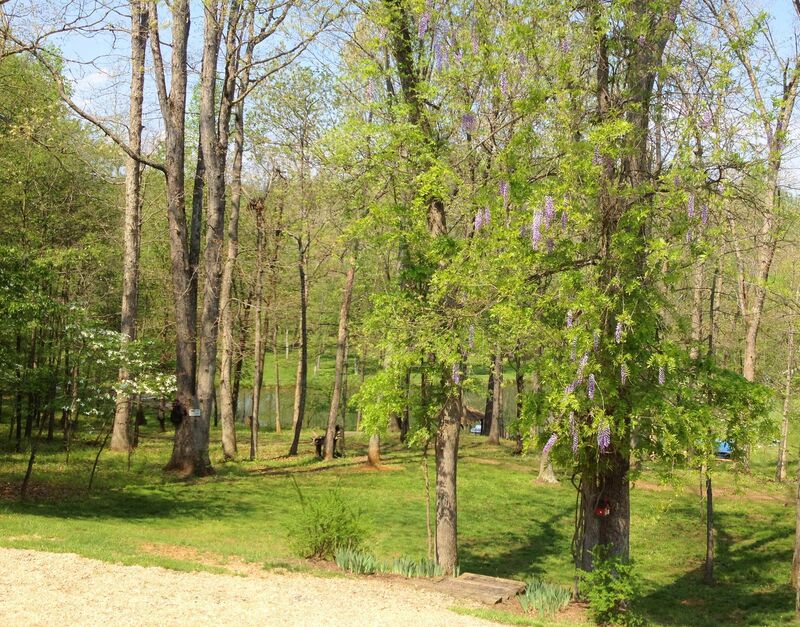 The Virginia Creeper is on the left. Note the regularity and uniformity of the leaves. The edge of each leaf is serrated and is a mirror image from side to side. “Leaves of three, let it be. Ok. So it doesn’t rhyme. But I bet you remember it, just the same. Oh, and what should you do if you should come into contact with poison ivy? Wash it off immediately. Dawn soap is great, because it is an oil fighter. And if you don’t know you have touched it until the rash appears? (Usually takes about 24 to 48 hours to manifest the tell tale itch). I swear by Zanfel. The price will take your breath away, but if you start using it as soon as you see the first bump, and scrub with it a couple times a day, it will help. It won’t go away immediately, but it will go away sooner. Think one week instead of three. So, head on out into the beauty of nature. Just be careful, and enjoy. Keep the llamas off the streets. 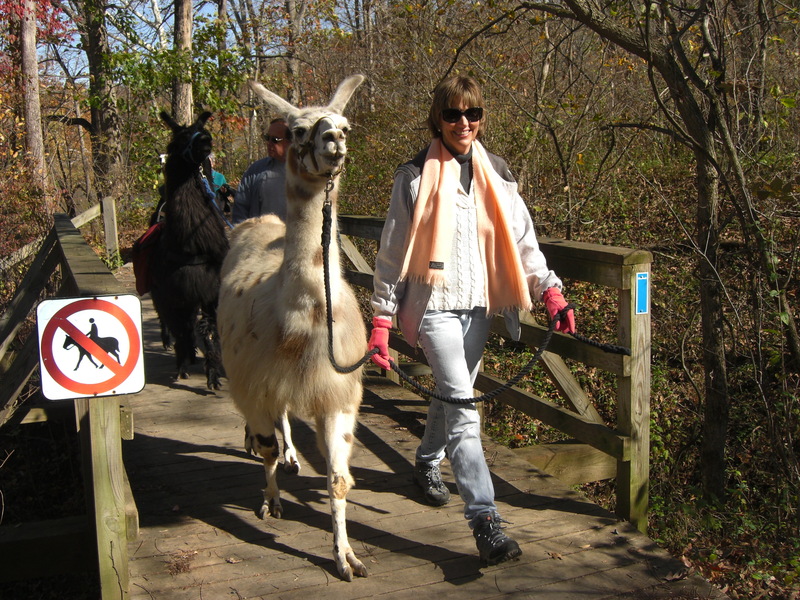 Book a llama hike now!! So…What do you do with a llama? Llamas are wonderfully versatile animals and there are lots of things that people enjoy doing with them. 1. Packing. 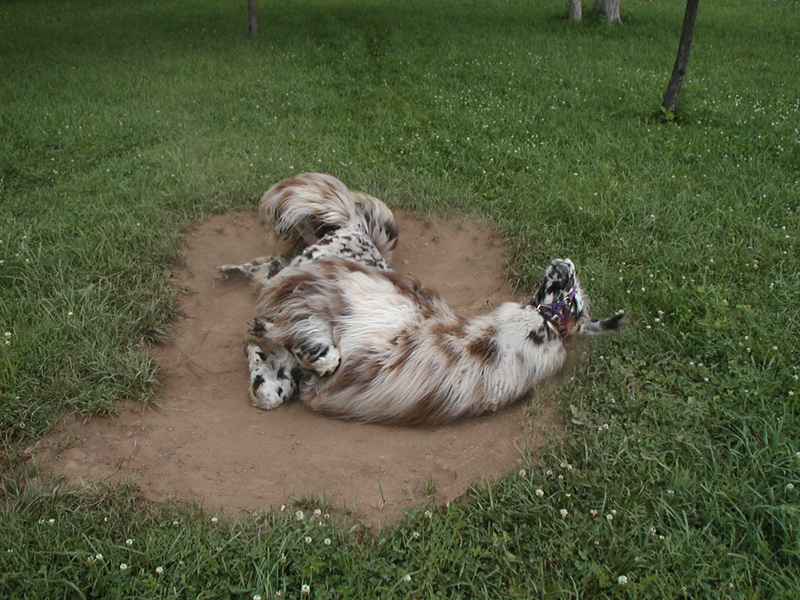 After all, this is what they were bred to do for thousands of years in South America. The greatest advantage of llamas as packers is their low impact on the environment. Their padded feet do less damage to the trail than people in hiking shoes. They are much smaller than horses or mules with the average pack llama weighing between 300 and 400 pounds. Llamas require much less to drink than most pack stock. Since they are members of the camel family, they are able to obtain much of their water from the foods they eat. 2. Shows. 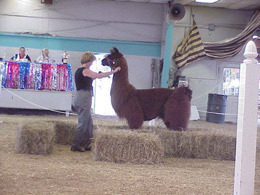 There are llama shows all around the nation where llamas are judged on their fiber and conformation and they can compete in a variety of agility and obstacle courses. 3. Parades. 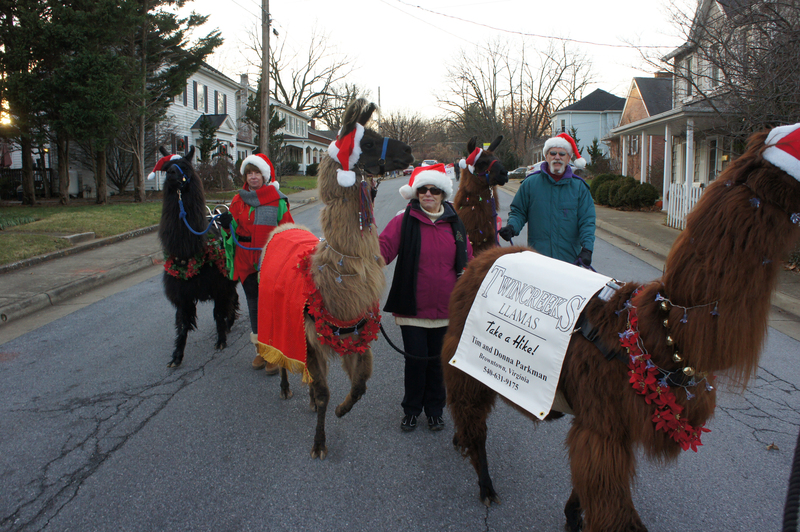 Who doesn’t love a parade, and everyone loves to see llamas in a parade. We have walked with ours in several Christmas Parades. We dress them up in reindeer antlers and tinsel and they are the hit of the day. They have been real troopers and haven’t been spooked by the High School Bands, fire engines, horses, or dogs. AND I have never had to clean up poop behind them. 4. Fiber. One of the most prized byproducts of llamas is their fiber. Their fiber can be used to make anything that you can make out of sheep wool. Plus llama hair does not have lanolin and comes in a variety of natural colors. 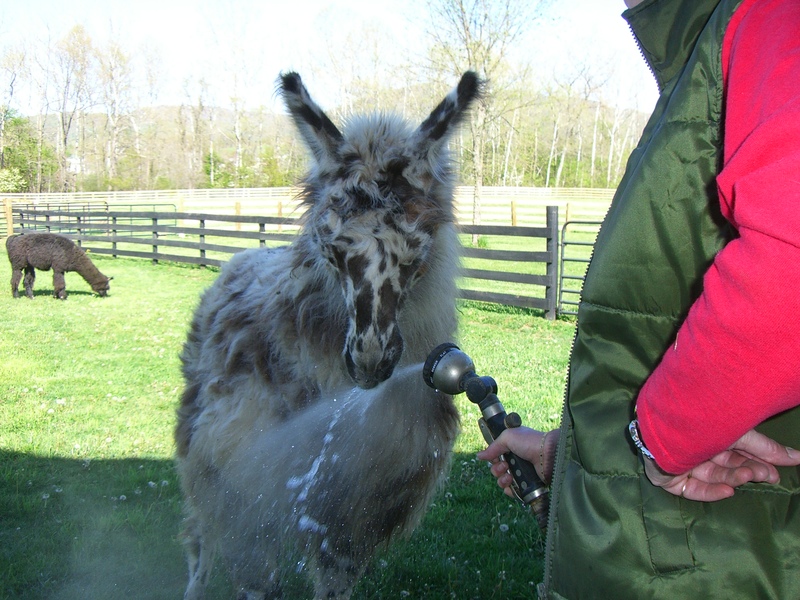 We shear our llamas once a year, usually in April or May, when the temperatures are above freezing and the highs are in the 70’s. By the time winter comes around again, their coats are grown out enough to keep them warm. 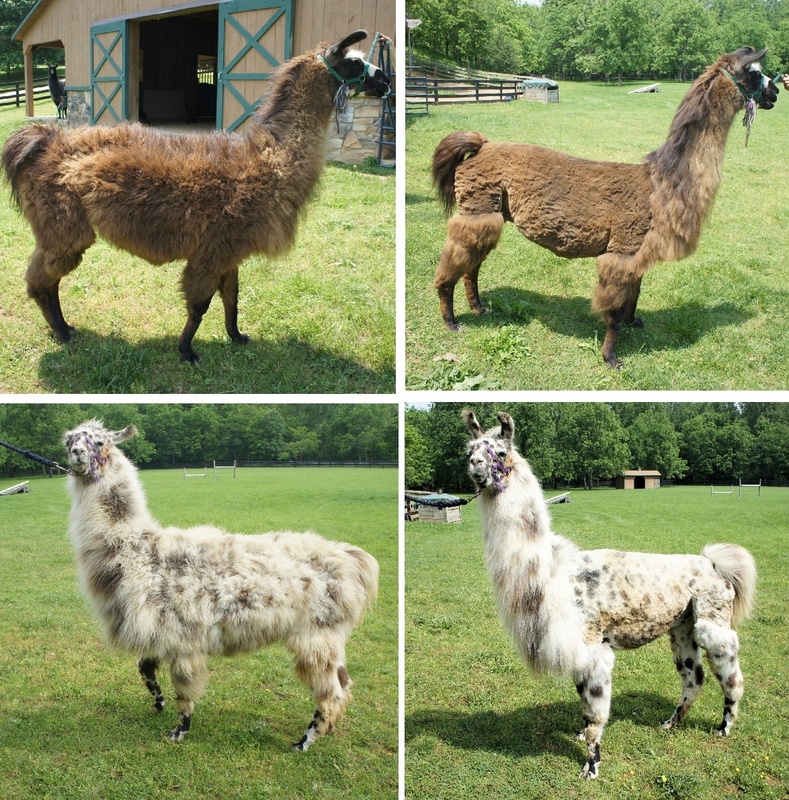 Shearing the llamas is an absolute necessity. 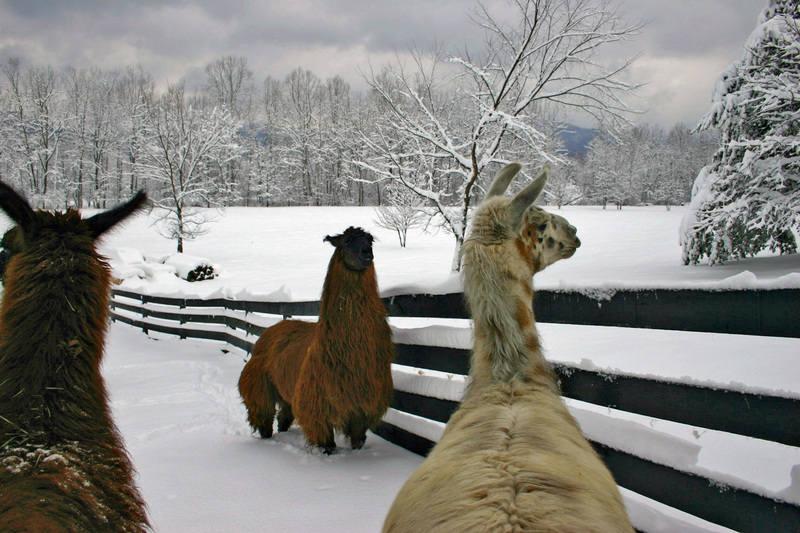 Heat stress is a major killer for llamas, especially with the heat and humidity in Virginia. 5. Pets. 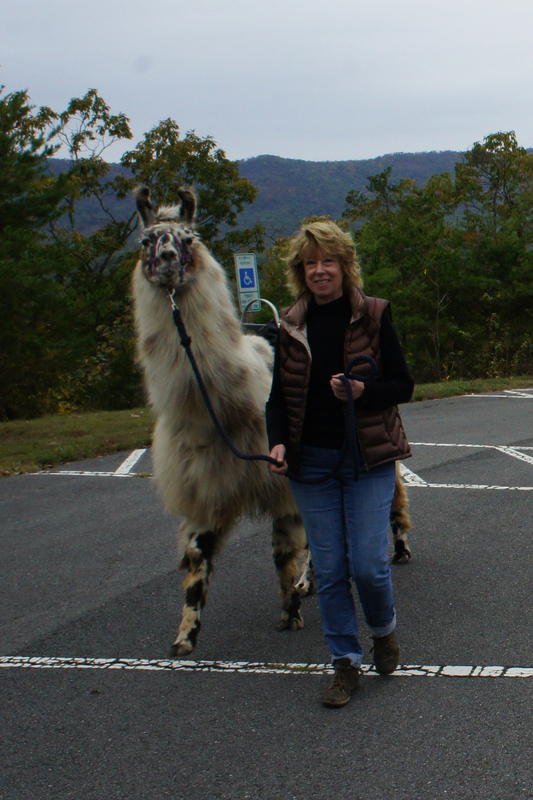 Although we pack with our llamas as a business, they are first and foremost our pets and companions. The time we spend with them brushing and grooming, feeding them, and even cleaning up poop, is very relaxing and enjoyable. We talk with them and watch as they interact with each other. Llamas can be very entertaining and affectionate in their own way. Oooo! The water tickles my tongue. 6. Therapy animals. Llamas are often taken to nursing homes and children’s hospitals to brighten the day and bring a smile. Llamas are intuitive and seem to sense the needs of others. They are very calm and gentle animals. 7. Guardians. Llamas make good livestock guards. They prefer to be with their own species, but they will adopt and bond with their new herdmates, be it sheep, alpacas, or cows. 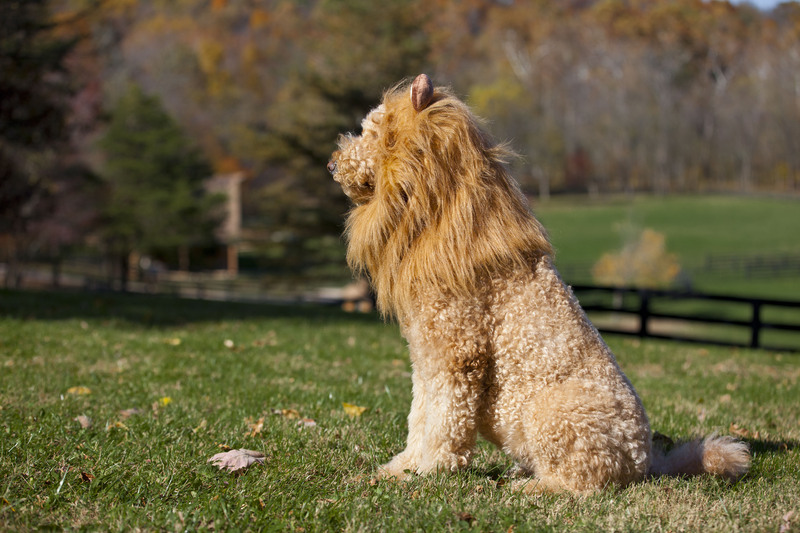 They are very protective against coyotes, wild dogs, and other predators. 8. Golfing. Believe it or not, there are golf courses that use llamas as caddies. I’m not much of a golfer myself, but I could get into the game if I could walk the course with a llama. 9. Carting. Llamas can also be trained to pull a cart. They can be used singly or as a team. I expect that it would take a good bit of time and patience to master this skill, but I can only imagine the attention that you would get driving your llama through the park. 10. Walking and jogging. Sometimes I want a change of pace from walking the dogs. I halter one of the llamas and take a relaxing walk around the neighborhood. The llamas are very curious and attentive, and it is entertaining just to watch them as they observe the interesting things along the way. So you see, llamas can be much more than just a pasture ornament, though that is one of the greatest pleasures that they give to me. There is no better feeling than to gaze down on the fields, no matter the season, and watch the llamas as they bask in the sun, roll in the dust, munch grass, hike through the snow, or pronk around the fence in expression of the sheer joy of life. So, what do YOU do with a llama? 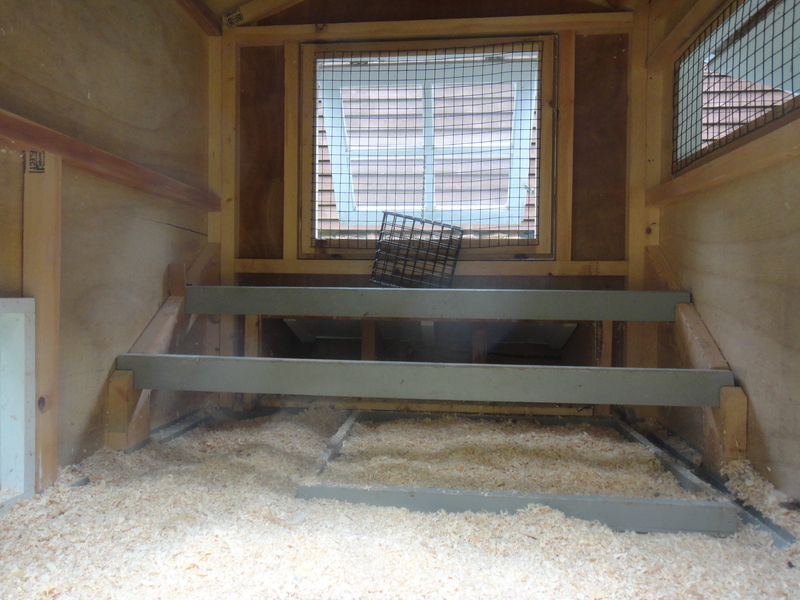 Now, I know you are going to say that I’m one egg short of a dozen, but I recently saw, in one of my farm publications, an article about nest box curtains. 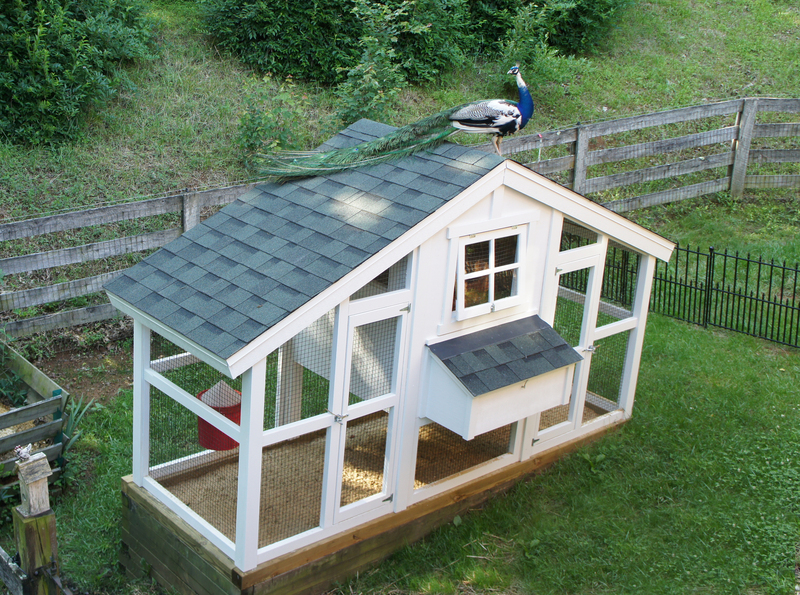 The photos were adorable, and I thought, if for nothing else, my young hens needed a home improvement project. Before embarking on this undertaking, I decided to do a little research to hopefully find a design that didn’t involve sewing. I used to sew…..somewhat. I had a basic cabinet machine that my Mom had bought when I was just a kid. Granted it was ugly, it only did straight stitching, and it took up floor space, which we were always in short supply of. But it was always there…always up and ready to go. If I needed to repair a 1 inch seam…zoom, it was done. About 20 years ago, my sweet road warrior surprised me for Christmas with a new portable machine that could be packed up and stored out of sight and could do zigzag stitches and button holes. We were living in Italy at the time, so when we were ready to pack out and return to the states, I gave the old cabinet machine to my Pilipino housemaid. The portable machine now sits in the back of a closet, behind rolls of Christmas wrap and boxes of shoes, and gathers dust bunnies. It’s too much trouble to dig out and set up, so it hasn’t been used in years. I have forgotten how to sew. So… back to the chicken curtains. 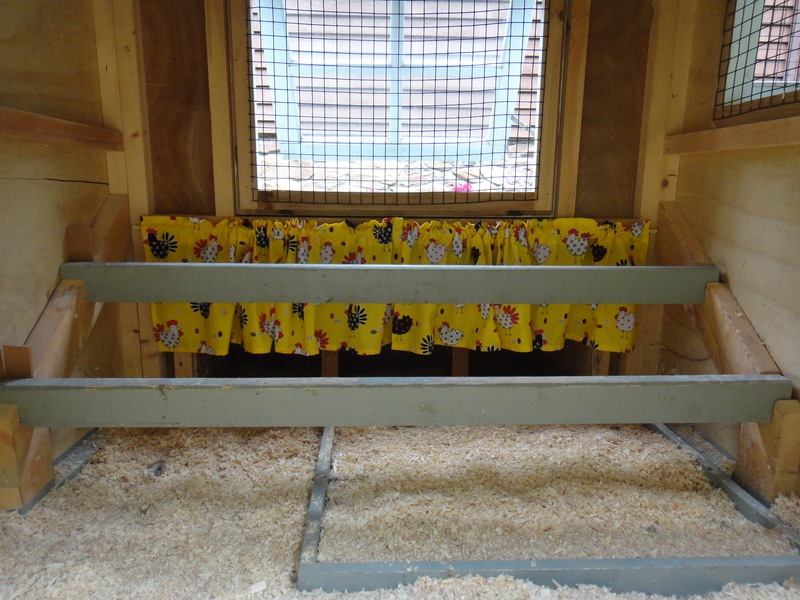 Who knew that the idea of curtains for the chickens nest boxes has been around for decades, maybe centuries? Old time farmers used to tack up old gunny sacks over the nest box openings to provide the hens with privacy. 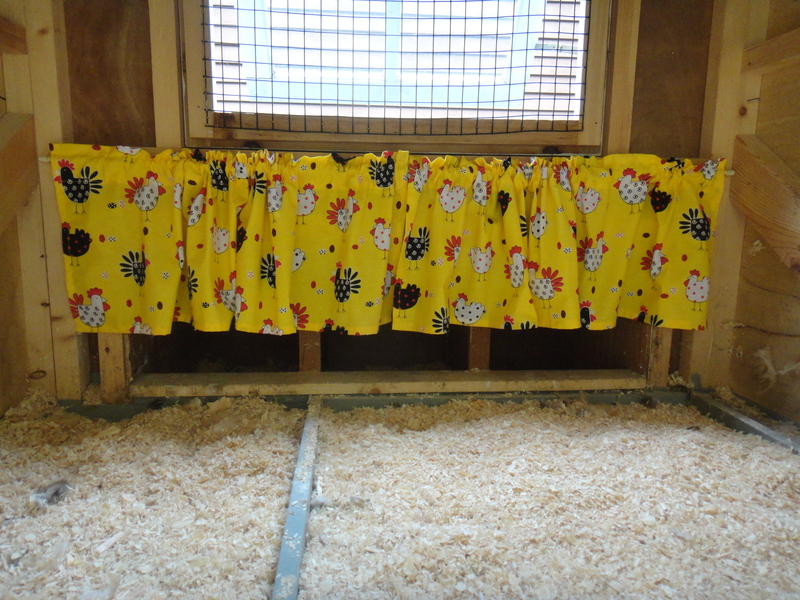 Chickens apparently prefer to lay their eggs in a dark and secluded space, hence, a good excuse to hang some jazzy curtains. There are lots of gorgeous coop curtains out there. Just google it, if you are interested in seeing more ideas. Many talented ladies make curtains with tie backs. Personally, that would have been my preference, but definitely involved more sewing skills than I wanted to resurrect. Then I saw some that were just straight valances….nothing more involved than sewing a rod pocket and a hem. But, it did involve digging out the dreaded machine and spending more time setting it up than the time it would take to do the whole sewing thing. So I opted to find a readymade valance. Just by chance, I found a wonderful lady on Etsy that makes custom curtains, and she made these cute valances for me. I love the comical chicken design, and the colors were just perfect to brighten up the place. I can’t say for sure whether the chickens approve, they haven’t started laying eggs yet, but it sure makes me smile while I’m scooping out chicken poop. If you live in the Northeastern U.S., you may be familiar with the number 1, most hated, invasive weed in the region, Garlic Mustard. It is a member of the mustard family, but has a distinctive garlic aroma when the leaves are crushed. This weed is a non-native plant that was introduced from Europe back in the late 1800’s as a culinary herb. But it has gotten out of control and is taking over our woodlands, and strangling out our native plants. 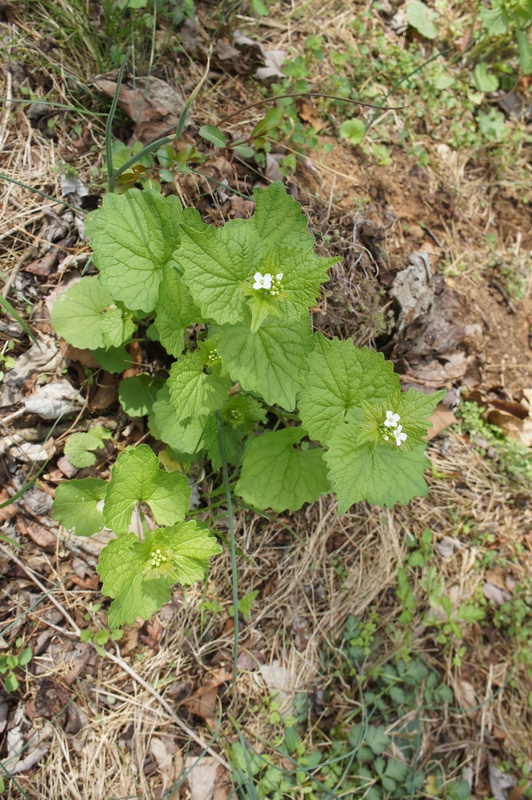 As a result, many communities are hosting Garlic Mustard Pulling Parties, where people are encouraged to gather for the day to yank out these pesky plants by the wagon load. I checked out a few recipes online and picked bits and pieces of several recipes to come up with a recipe that suited my taste. I prepared it for the first time last night, and it was surprisingly delicious. I’m going to show you how I made it. 2 cups (packed) garlic mustard leaves. Pick greens from an unsprayed area and make sure you wash them well. I started by picking off all the leaves and tossing them in a sink full of water. After swishing them around really well, I scooped them out by the handful, and squeezed all the water out of the leaves. I packed them really tight into a measuring cup. 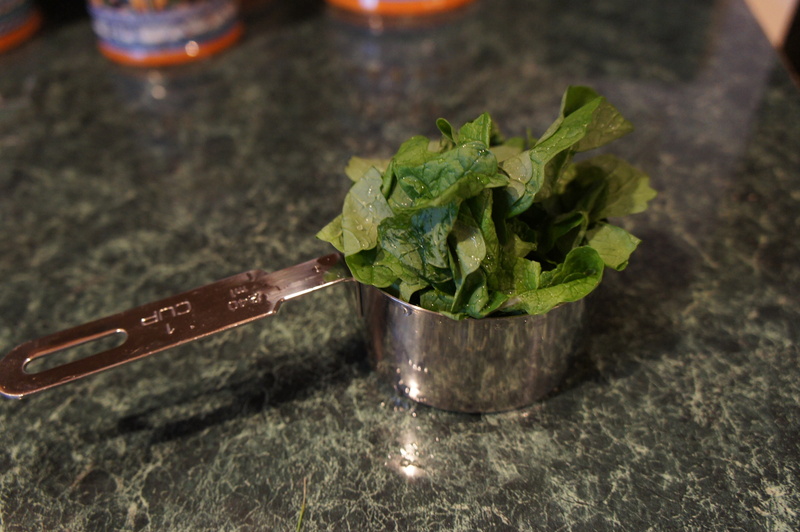 You need two cups of firmly packed leaves. It was about now, that I realized I didn’t have any chives. Well, I thought, this recipe is all about “the wild thing”, and we have plenty of wild spring onions sprouting everywhere, providing the llamas hadn’t eaten them all. (Our llamas love feasting on spring onions, as evidenced by the miasma of onion stink on their breath). So I grabbed my scissors and headed down the hill to harvest a clump. 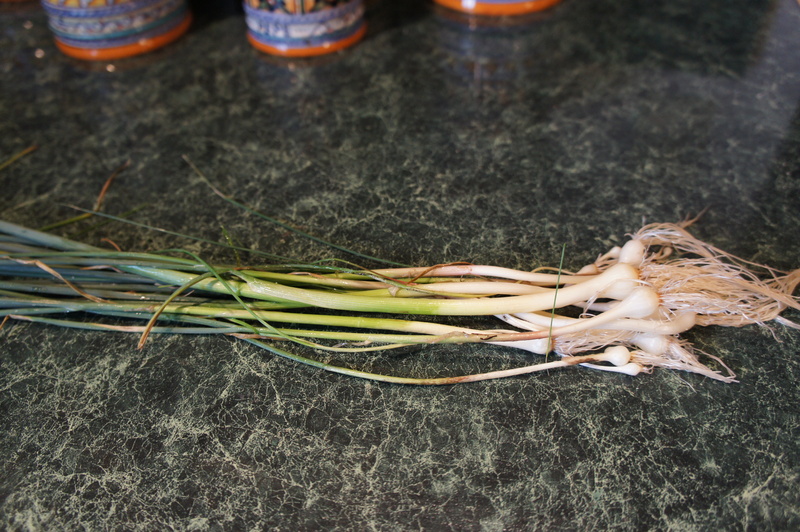 I had read a while back that the green tops of the wild onion were tasty in recipes, but to scale back on the amount, as they have a stronger flavor than the domestic variety. Wild spring onions. Use only the green tops. I had no idea what I was doing, but I decided that I’d go for 2 Tablespoons of the wild onions instead of the 3 tablespoons of chives. 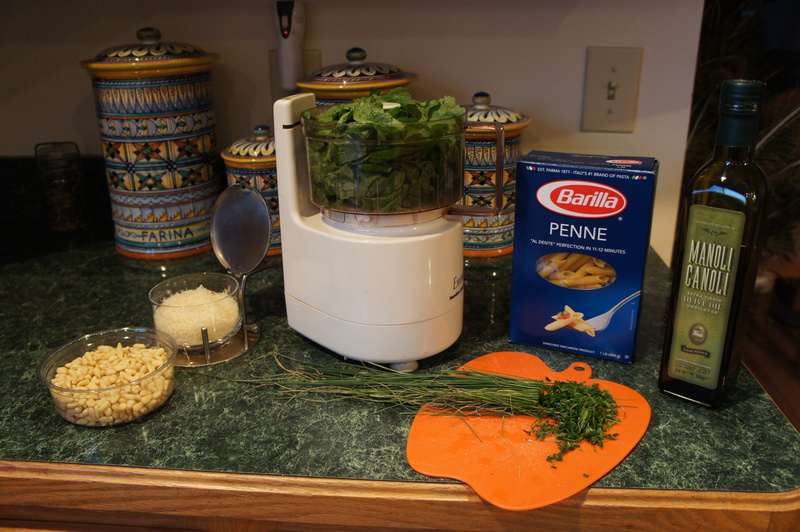 I minced them finely and tossed them in the food processor along with the 4 ounces of extra virgin olive oil and ran the food processor until the greens were finely chopped. 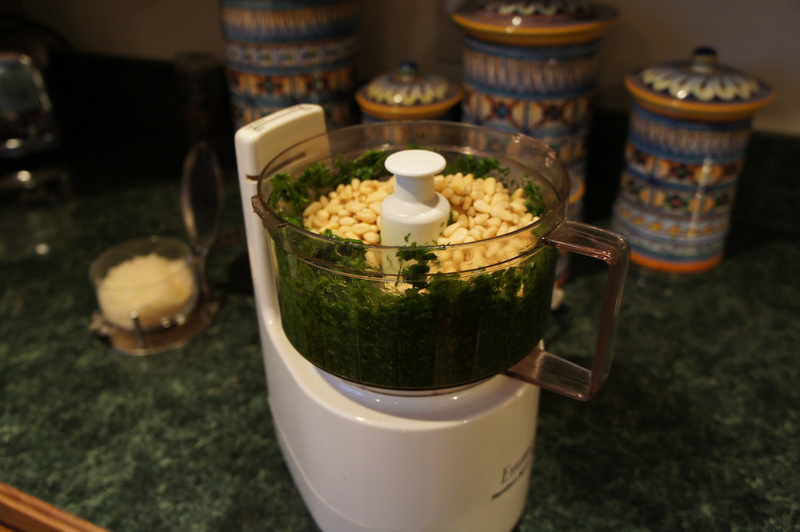 Next I added the pine nuts and processed the mix until it had the consistency of a paste. Add 4 ounces of pine nuts. At this point I transferred the mix to a mixing bowl and stirred in the parmesan cheese. I thought the pesto was a little too thick, so I added another tablespoon or two of olive oil until the consistency was right, and tasted it for salt. WOW! Now, I must admit, I was prepared to hate this stuff. But, boy, was I surprised. It was delicious. 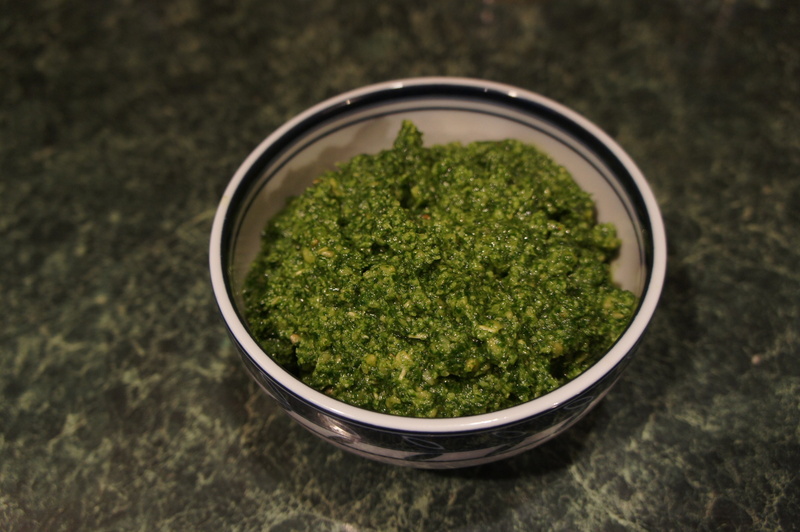 It tasted a lot like traditional pesto, but it had a little zing. The garlic mustard leaves by themselves remind me of arugula, a little bit bitter and peppery. 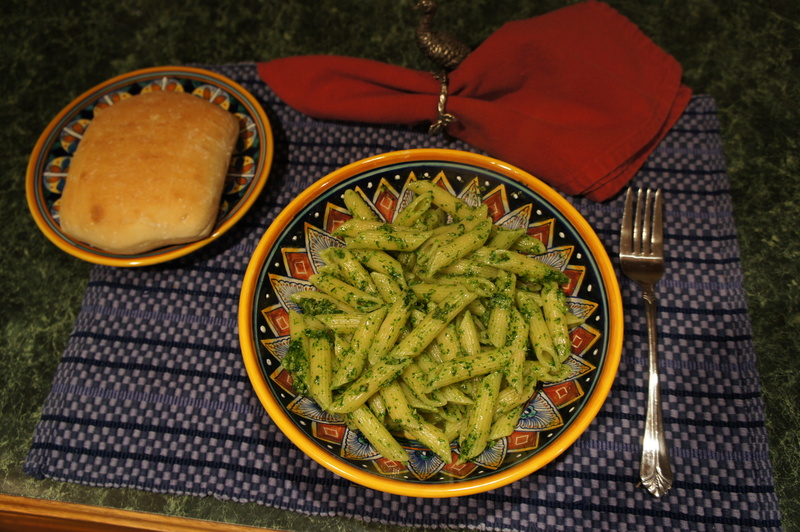 And this flavor came through very subtly in the pesto. Now I couldn’t wait to boil up the penne and enjoy this taste of the wild. I’m glad I don’t have to hate those pesky weeds nearly so much. Now I just need to find a way to love dandelions. Feel free to give this a try, and let me know what you think. 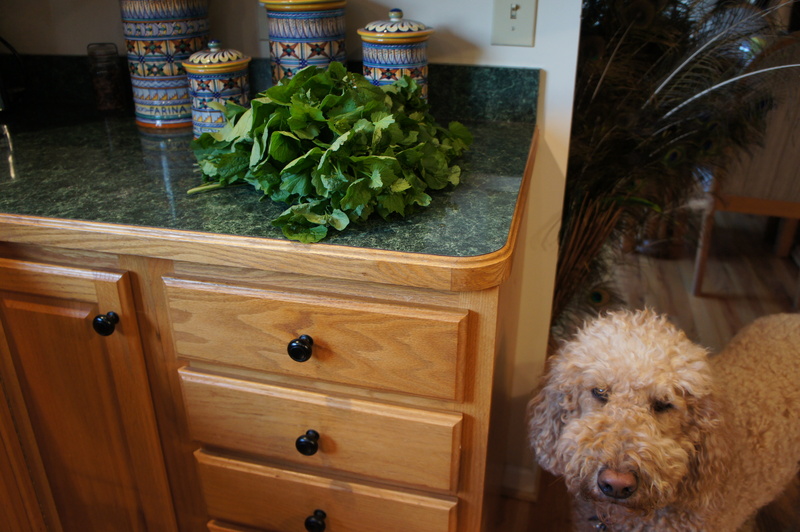 Toss mustard greens, chives, and olive oil into food processor. Run processor until leaves are finely minced. Add pine nuts and process until it resembles a paste. Remove paste from processor and place in a mixing bowl. Add Parmesan cheese and salt to taste. Serve over cooked penne pasta. Sprinkle with additional parmesan if desired.